Inazin Power - Why Inazin? Inazin continues to excel in the development of utility scale solar PV and wind farms and has recently brought its specialist experience to the commercial rooftop sector. Industry leading in-house capability in all aspects of solar and wind development allows the company to consistently deliver bespoke renewables solutions in a constantly evolving industry. The speed and efficiency with which our projects are developed and the strong relationships we foster with both our customers and partners, contributed to Inazin’s successful development of the UK’s very first large scale solar schemes, accredited by Ofgem. We have continued this momentum through subsequent FiT and ROC schemes. Commercial terms for the development are agreed under Heads of Agreement which form the basis of the Option and Lease agreements that will bind both parties for the duration of the lease. These are signed and secured prior to planning. Commercial terms need to be acceptable to both landowner and investor for any development to proceed. It is important for us to assess whether a grid connection is both technically possible and financially viable, as this has become one of the main constraints for large scale renewable developments. We will aim to secure a connection offer from the local DNO to establish capacity prior to planning submission. Our parks are designed to minimise visual and physical impact on the landscape and local surroundings. We work closely with local planning officers, consultants and the community to mitigate concerns that may be raised through the planning and development process. We consult with the local community, Parish Council and Local Authority on every development to explain our proposals and gain valuable community feedback which we then incorporate into the potential planning application. We always try to minimise our impact on the community during construction but also for the longevity of the project. A specialist engineering, procurement and construction contractor is appointed to build each project. The development is overseen from beginning to end by one of Inazin’s experienced Project Managers who ensure that the site complies with planning and HSE requirements. Following the successful construction of the project, responsibility is seamlessly passed to our funding partner’s asset management team who will manage the project through its operational life. This can include land management, maintenance and cleaning. 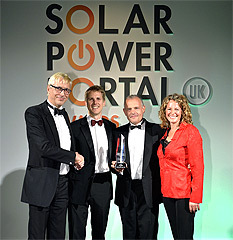 Building on the success of a nomination in 2013, Inazin Power and Low Carbon were proud to win the 2014 Solar Power Portal Award for the Lackford development in the >10MW Utility Scale Solar Park category. Inazin CEO, David Sandilands and Low Carbon Investment Director Ian Larivé collected the award from Kate Humble.